When I first drove Volkswagen’s 2.0-litre diesel Jetta a few weeks ago (Autocar, 26 January), I also got a steer in the lowest-powered diesel model, the 1.6-litre unit toting 104bhp. There’s a petrol 1.2 turbo of the same poke, but the British market won’t be taking it. Mostly, you’ll find the same things to like about the 1.6-litre diesel as the 2.0-litre. The Jetta is a near-Passat-sized car at a price that undercuts its bigger sibling. It has a fairly big boot, a roomy enough cabin and perceived quality that’s more similar to a Golf than the Passat range, but entirely excusable at its price level. This little power doesn’t sound like a lot for a 4.6-metre-long car and, well, it isn’t, but it’s not so bad. Zero to 62mph comes up in a touch under 12 seconds, and the BlueMotion-badged model (which gets part-time alternators and stop-start) emits just 109g/km of CO2 in manual form (113g/km as a DSG). It’s quiet, too. If you do serious motorway miles, I’ll wager the Jetta would offer seriously economical cruising economy – probably better than a Toyota Prius, which is a similar size and not a million miles away on price. Officially this is a combined-cycle 67.3mpg, or 78.5mpg on the highway. Let’s call it comfortably 50mpg plus. Where the 1.6 Jetta doesn’t do so well is also where its bigger-engined varieties don’t. Generally, the British market prefers hatchbacks to saloons at this size and price, which makes the Golf a better proposition again. The Golf is a more dynamic steer, too. But if you fancy a saloon, and one that’s refined and frugal at that, the Jetta makes a convincing case. If they sell a 2.0 tdi Bluemotion Technology, like the Golf, that is definitely better than the 1.6. I just got the Golf, and the 2.0 has similar real world economy, is also in the bottom BIK tax bracket, is quieter and is usefully quicker than the 1.6. Still running in, so taking it easy, it can acheive over 60 mpg on daily commute. 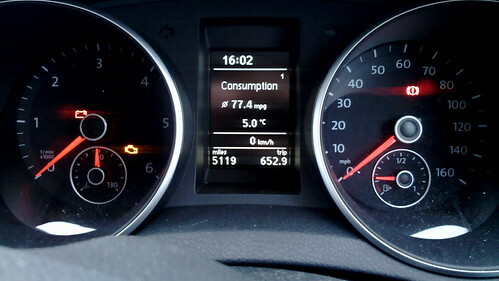 Drove a Golf Estate Bluemotion from London to Manchester with 3 of us and luggage the other day, set the cruise control to 56mph, stereo on loud, windows wound down at various times while we smoked, and we managed 77.4mpg, guess must have been over 72 allowing for computer error. On VCA database 1.6 is 71db(a) compared to 73db(a) for the 2.0. Long term readout normally says 59mpg. 56mph must have been painful... Can you repeat the experiment at 70mph with no windows wound down for smoking (Who lets someone smoke in their new car?!) - occasional aircon and some "tunes"? I'd be really interested in what it can return on a cruise like that. [quote 230SL]set the cruise control to 56mph[/quote] I'm intrigued why set the control to 56mph, I assume at this speed you never need to change lanes, did you get much abuse from the lorry drives as they went passed. I assume you stayed in the inside lane for most of the journey. You know, it's not that bad really. Yes, you stay in the inside lane - shouldn't everyone, except when overtaking? No, lorry drivers do not give you any abuse, provided you remember the code, and flash them back in as they clear your front bumper. The other point is it's unbelievably relaxing. For decades I was a frequently over the limit outside lane runner, except when someone more adventurous than I came up behind. Recently I've slowed down a lot, and it's not just age. By the way, I drive a Bora and am considering a new Jetta! [quote Walking]I'm intrigued why set the control to 56mph, I assume at this speed you never need to change lanes, did you get much abuse from the lorry drives as they went passed. 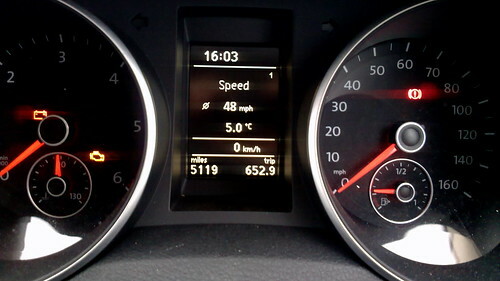 [/quote] 56 mph is the maximum speed trucks are governed to in the UK, about 60mph on most car speedometers. Clearly the 1.6 Bluemotion is better for ultimate mpg. The VCA noise data is fron the European standard drive-by test at 50 km/hr. At motorway speeds, the 1.6 is working a bit harder than the 2.0, so is a bit noisier to my ears.